For The Love of Hops is a book written to provide information and background on the history and lineage of hops, where they come from and what they are. This book is split up into two sections. 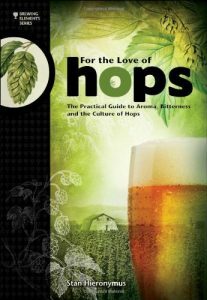 The first section offers great detail and in-depth knowledge about essential hop oils, hops harvests, growing and cultivating, the different forms used in breweries and homebrewing, and the future of where are hops are headed. The second section covers all the technical aspects of hops including chemistry of hops, important calculations, bitterness and how its measured, and how to maintain hop quality and freshness. As with Malt: A Practical Guide from Field to Brewhouse, if you understand going in that this book does not directly relate to homebrewing techniques and recipes, you will enjoy it and learn a lot. For the Love of Hops expertly explains the nature of hops, their origins, and how brewers maximize their positive attributes throughout the brewing process. Author Stan Hieronymus starts with the basics of hop chemistry, then examines the important role farmers play and how brewers can best choose the hops they need. He provides fundamental information about and descriptions of more than 100 hop varieties, along with 16 recipes from around the world, including from top U. S. craft brewers. Hieronymus explores hop quality and utilization with an entire chapter devoted to dry hopping. Throughout, Hieronymus’ research and accessible writing style educate the reader on the rich history of hops and their development into an essential ingredient in beer.